Green garlic isn’t really wholly green, just its stalk. Thus, a more accurate name might be baby garlic — because that’s just what it is. Garlic is sown in the fall and mature heads are harvested in early summer. If you pick it prematurely — right about now in New York, for example — you’ll wind up with young garlic, or green garlic, as it is most commonly known. Its flavor is far more mild than its older counterpart, and it is a popular substitute for leeks, onions, or scallions. Creative chefs, however, are taking this ingenue of an aromatic and making it the headliner. Look for it in everything from consomme and creamy soup to flan and risotto. Find out what diners are raving about in recent restaurant reviews — and don’t miss your chance to sample this short-season savory star. 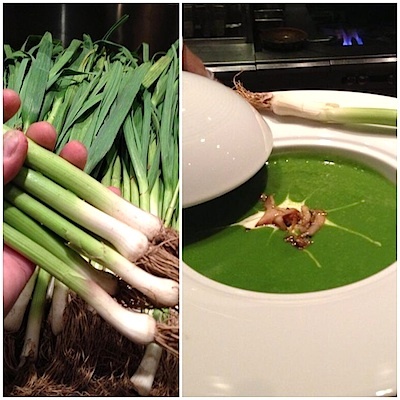 Have you had green garlic yet this season? Tell us which restaurant you ordered it from — and how it was prepared!